XM Broker continues to offer outstanding Forex promotions in 2018. 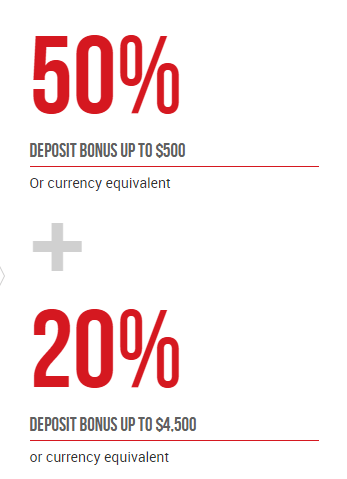 Now XM clients are offered a two-level Forex deposit bonus (Welcome bonus) up to 5,000 USD. Moreover, the credit bonus is actually a margin bonus, which means you can use it to maintain your open positions; the bonus won’t be written off. 1st level - 50% of your deposit with a maximum bonus of 500 USD. For example, you have deposited 4000 USD; you will receive 50% on 1000 USD which is equal to 500 USD (First level max bonus) and 20% on 3000 USD (Subsequent deposit). You will gain 500 USD + 600 USD Bonus, ending up with 5100 USD tracing account balance. You can use the bonus to increase your account equity and for trading purposes. You can absolutely withdraw any profit made by trading the bonus. The bonus, of course, won’t be available for withdrawal. As easy as pie. Just make a deposit in any of your XM trading accounts (Promotions are applicable to all account accounts except Zero account) and receive the bonus. Promotions are only applied to new clients at XM Broker. Any withdrawal from client trading account will remove all previously added bonuses. Get XM 50% - 20% Bonus Now!